Gloucestershire started their 2015 County Championship Division 4 campaign with a comprehensive 97-run win against Buckinghamshire at a picturesque Moreton-in-Marsh CC. Buckinghamshire won the toss and asked Gloucestershire to bat in overcast conditions. The rain arrived after 4 overs, and play was delayed for 55 minutes before Abby Evans and April Wells resumed. They took the score to 32 before Evans was caught behind for 9. Three quick wickets were then lost for 4 runs as Gloucestershire fell to 36-4 in the 17th over. It was then that 14 year old Danielle Gibson changed the game completely with a high class and entertaining innings. Positive from the start, she despatched the bad balls with regularity and put Buckinghamshire on the back foot. Hitting powerfully, particularly off the back foot on both sides of the wicket, she dominated the bowlers and rapidly reached her first 50 in senior county cricket. She and April Wells put on 90 in 16 overs before Wells fell for a patient 21 with the score on 126. Danielle’s innings came to end with the score on 134, but not before she had thrilled everyone with a superb 73 from only 52 balls, including 12 boundaries. 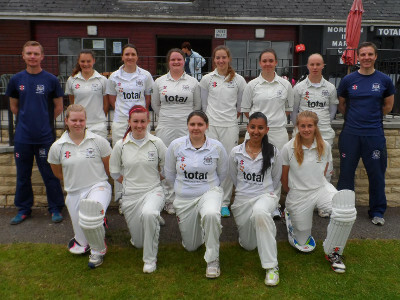 Hannah Thompson (21*), Eve Alder (15) and Chloe Davis (16*) then all played very positively to add a further 72 from the last 16 overs, taking the score to a very competitive 205-9 from the allotted 50 overs. Gloucestershire’s bowlers Sidra Khan and Eve Alder started well, bowling a full length and a tight off stump line, and were rewarded when Alder bowled Jerczenko with the score on 10. Buckinghamshire dug in and the 2nd wicket partnership between Turner and Benson took the score to 55 before Laura Marshall completed a very smart stumping off Chloe Davis to dismiss Turner for 25. From this point Gloucestershire took control and wickets fell regularly, backed by some very tidy and energetic fielding, notably a superb diving catch by Sidra Khan at deep backward square. Chloe Davis (3-26) and Abby Evans (2-15) bowled their spin with good control, and Eve Alder (2-14) also bowled tightly to keep pressure on the Buckinghamshire batters. Once Alder dismissed Sue Benson for a solid 46 from 93 balls, it was left to Danielle Gibson to come back on to finish off the lower order and she duly completed this task, bowling with good pace. It topped off an excellent day for her personally as she finished with figures of 3-17. The innings ended in the 37th over with Buckinghamshire bowled out for 108. Gloucestershire are back in action on 14th June, with two T20s against Northants and Hampshire.